We will see what we can do with collections. I put the objects department and job on paramaters to use their methods. If you go on the jobs’ page on frontend, you will se your request. You must have notice the addFieldToFilter on our collection, which create a filter on “status” field. You can use the method as many as you want ! More difficult to use, the “OR” condition. You cannot make many calls of the method addFieldToFilter because it creates “AND” conditions. So, you have to create a two parts array. The first part will contains the columns, the second will contains the conditions for each column. It’s simple conditions on only one column, for more complex conditions, you have to use Zend_Select methods. But before to learn that, I will explain you how to make joins. We will create a join with departments table. – The second is the join condition, here we put the department ID condition. – The third is an array of the columns we want to put on our SELECT. If nothing is put, we will have a SELECT * on the department table. The array key is the column alias, the value is the column on the database table. If no key is setted, columns will not be renamed (no “AS” in SQL). The benefit to use the getSelect() on our collection class is we can always return “$this” to return a collection object. If you did the getSelect() on the block, you would not have a collection object, but a Zend_Select object which is more complicated to use than collection on the block. You did the job ? We cannot use “where” and “orWhere”, because we have nested conditions. We have to use these two method for the first level, and fot the other use simple SQL. Why we have to do that ? Why we cannot use just SQL requests ? It is for the SECURITY ! In order to avoid SQL injections, Magento use the method “quoteInto” in order to “secure” the SQL string. 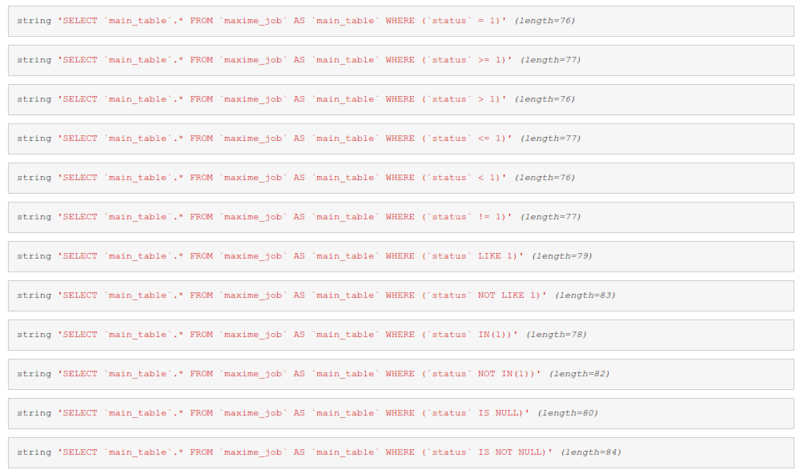 Furthermore, we retrieve a collection object, so it’s better to manage datas on the template page.